This Free food cost calculator works out food cost per dish and helps you calculate food cost percentage. It also helps you keep track of allergy and recipe information. Save yourself countless hours and download our easy to use food cost calculator. Our easy to use food cost calculator makes tedious hand calculations a thing of the past. 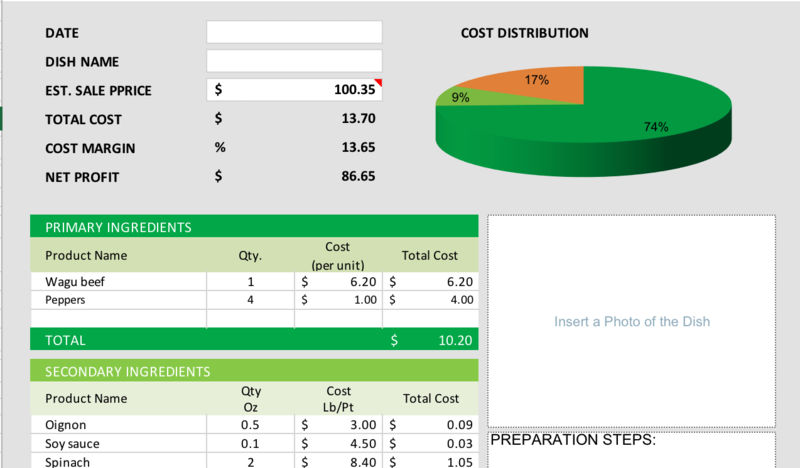 The food cost calculator is in Excel format. Automatically recalculates when ingredient cost is changed. Experiment with selling price to automatically see profit and cost margin. Include the cost of preparation and utlities. Join the thousands of people who've used the food cost calculator to stay on top of budgeting at their restaurant.